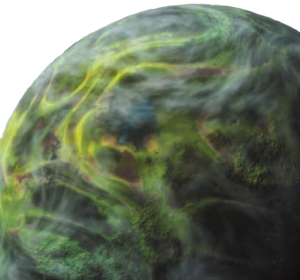 Palamok is the third planet of the Napret system, and the homeworld of the Yanme'e. The planet is orbited by four moons: Naxook, Oquiu, Ka'amoti, and Kami. The Yanme'e evolved on Palamok from a winged, tree-dwelling arthropod species. At some point, Palamok was observed by the Forerunners and the Yanme'e were indexed by the Librarian to be preserved on Installation 00 for preservation from the Halo Array. The Yanme'e were eventually returned to their homeworld. Eventually, the Yanme'e rebuilt their society and colonized at least two moons of Palamok: Oquiu and Ka'amoti. In 1112, the Covenant discovered Palamok while the Covenant was searching for Forerunner artifacts. A war broke out between the Yanme'e and the Covenant, and it was the Yanme'e that fared better in battle. However, San'Shyuum within the Covenant were not willing to glass Palamok, as they believed that Palamok's Yanme'e hives could be guarding Forerunner relics on the planet's surface. After the Covenant discovered how to communicate with the species, they made peace with the Yanme'e and incorporated them into the Covenant. Exploration of Palamok following the war provided no evidence of former Forerunner artifacts on the planet. An assembly of Hive Queens on Palamok would later allow members of the protector caste in be conscripted into the Covenant military. After the dissolution of the Covenant and end of the Human-Covenant War, many Yanme'e returned to Palamok and the Napret system. Palamok is a massive planet with a stable environment. The atmosphere is quite warm. Its atmospheric composition is similar to that of Earth, yet inhospitable to humans. Palamok itself is quite earthlike although significantly larger and tending to tropical extremes. It is a flat and geologically featureless world with little tectonic or volcanic activity. Palamok has average surface temperatures of 29°C to 42°C (84.2°F to 107.6°F), and has a gravity twice that of Earth. This would present a challenge on the evolution of the wings of the Yanme'e, but it gives them excellent flight skills in the gravity of Earth and caused the development of their hard carapaces. Palamok was home to dense jungles that covered a large part of the planet's surface. The jungle canopies were often home to Yanme'e hives. Palamok in Filipino means "increasing of mosquitoes", which likely refers to the insectoid body structure and behavior of the Yanme'e.